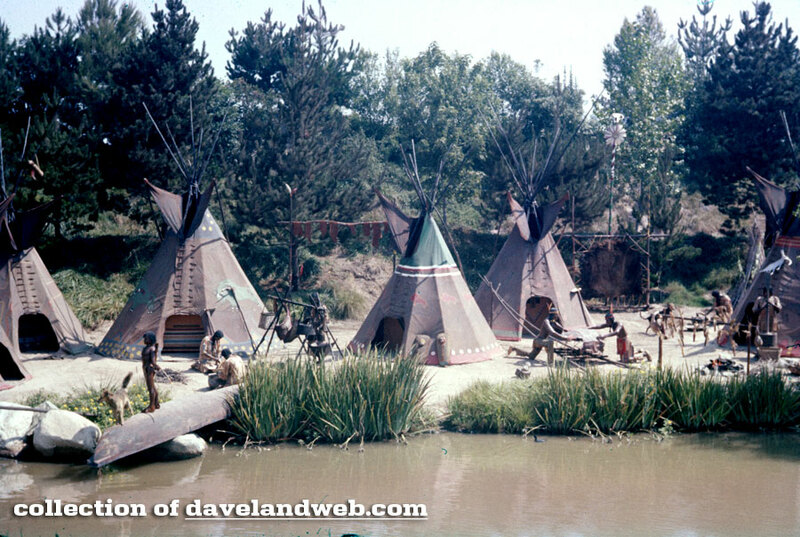 As I was updating the pages of my site, I realized I hadn't posted this Indian Village photo from the 1960's yet. Check out that signage! 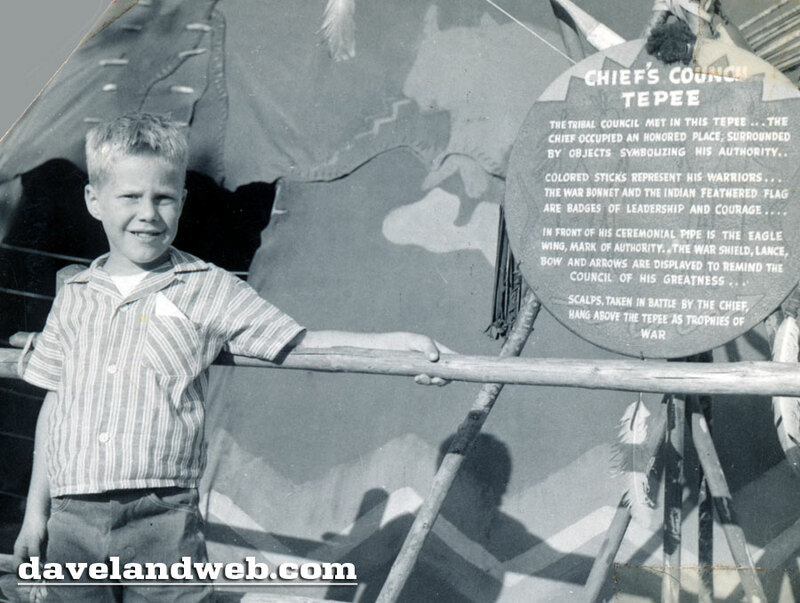 Think of what a thrill this was for this little boy—Cowboys & Indians come to life! 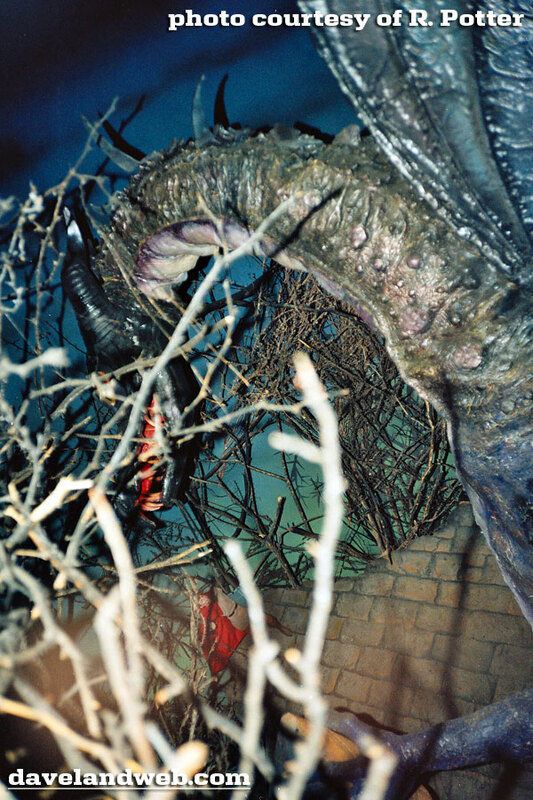 I had read your commentary about this scene and there was actually more to it than my picture shows—unfortunately the flash blurs the more interesting aspect of this scene so I'll have to describe it. 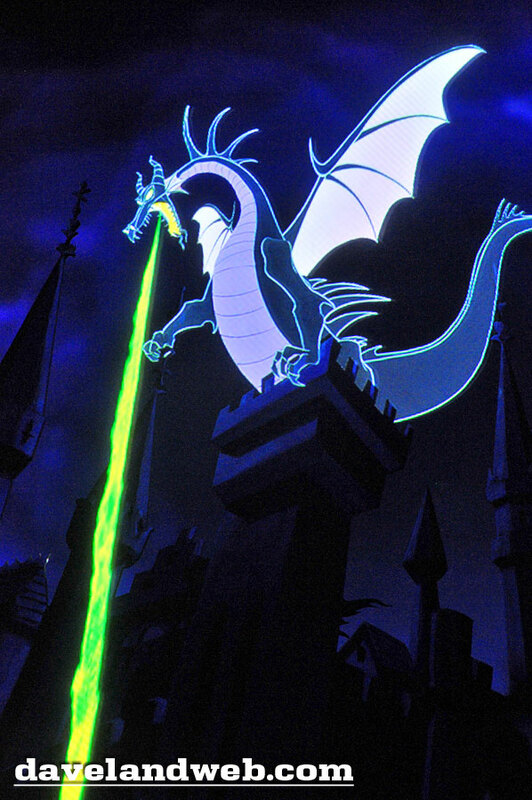 Along with Aurora climbing the stairs, there was a glowing ball of light that was seen near the top of the landing. 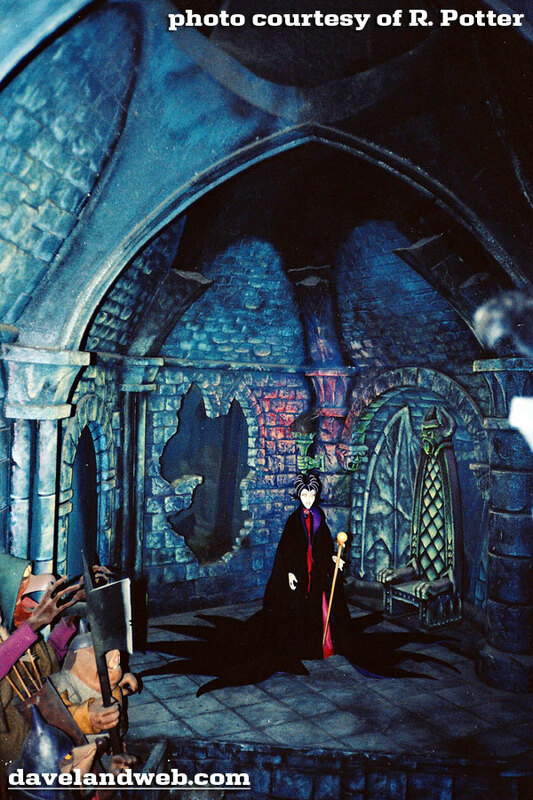 There was also a small figure of Maleficent that would come slowly out of the doorway onto the landing which made this scene more dramatic. But you can't see this from my picture, unfortunately. Flash or not, it's still amazing to have this colorful record of the 1991 version. Thanks again! 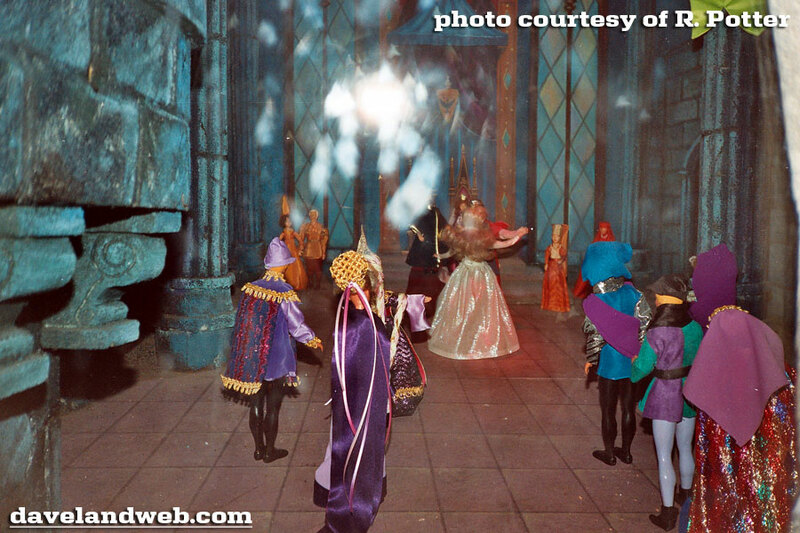 As a bonus, here's a January 1961 photo of the entrance to the Diorama. 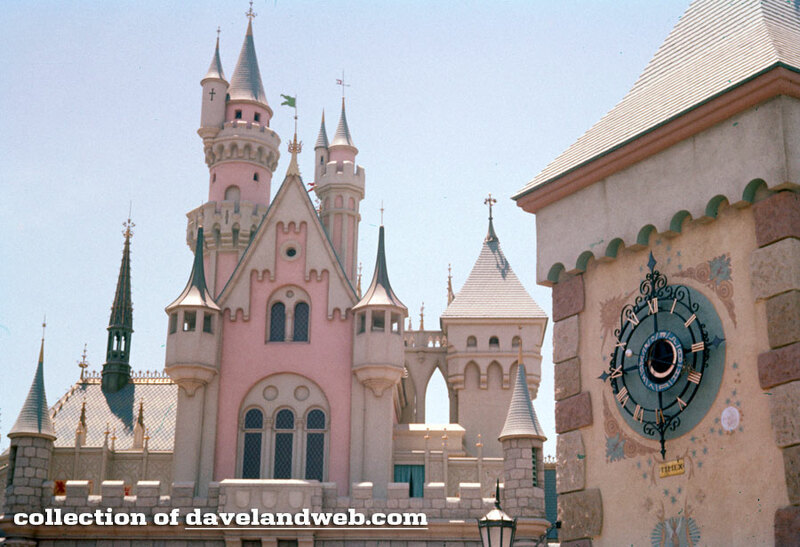 At left is Dopey, and cut-off at the far right edge is Christopher Fair, Disneyland jester from 1960-1963. 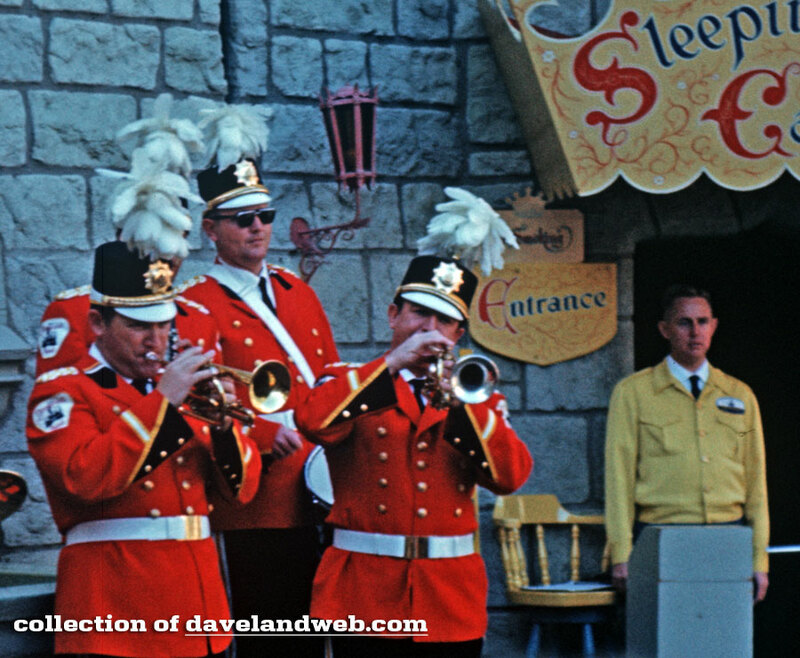 Zooming in for a better look at the Band uniforms and the cast member working the door of the Diorama. 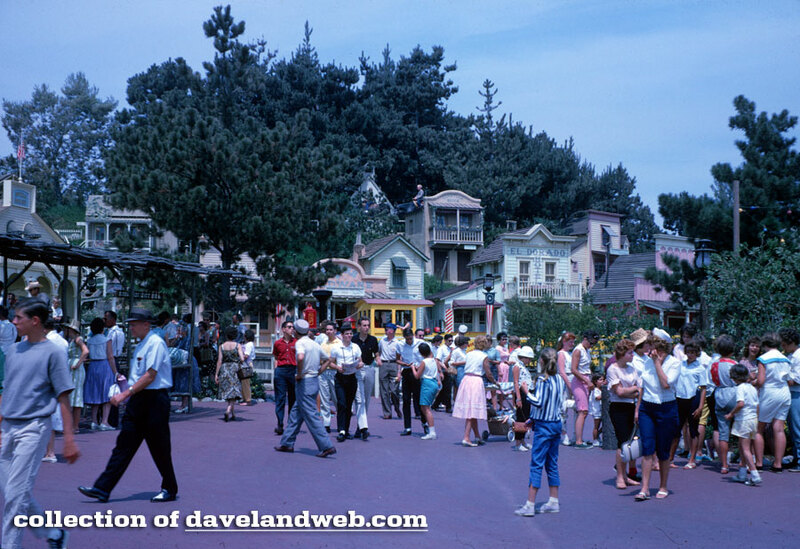 Follow my Daveland updates on Twitter and view my most recent photos on Flickr. 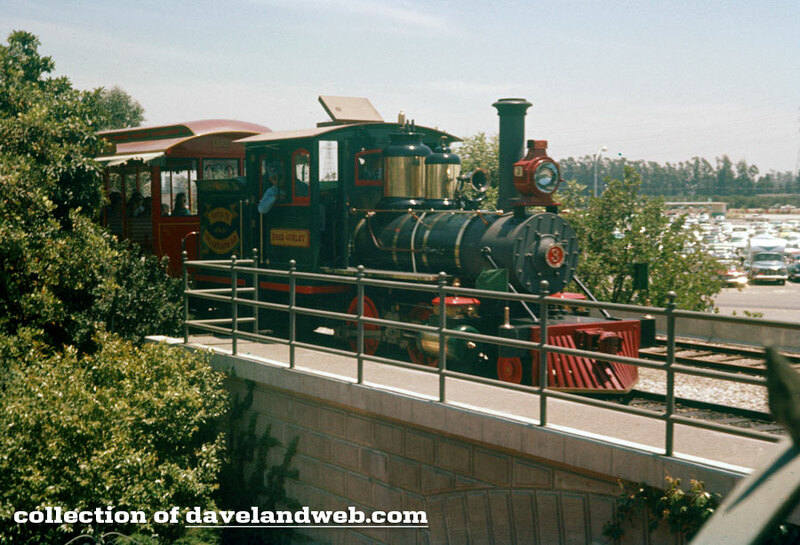 See more vintage and current Disneyland photos on my Disneyland web page. 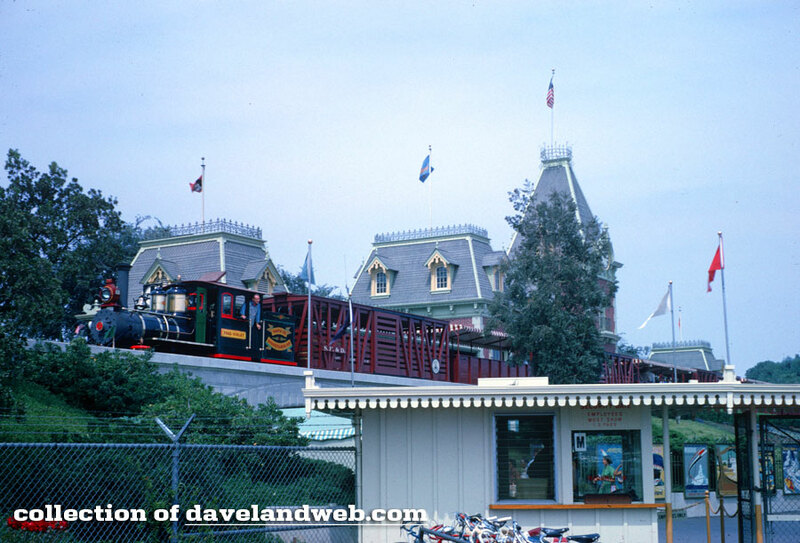 The Gurley is pulling into the Main Street Station. I have no idea how the photographer got this vantage point. He is either extremely tall, or climbed up onto something he probably shouldn't have. These little tots look like they came straight out of the Addams Family. 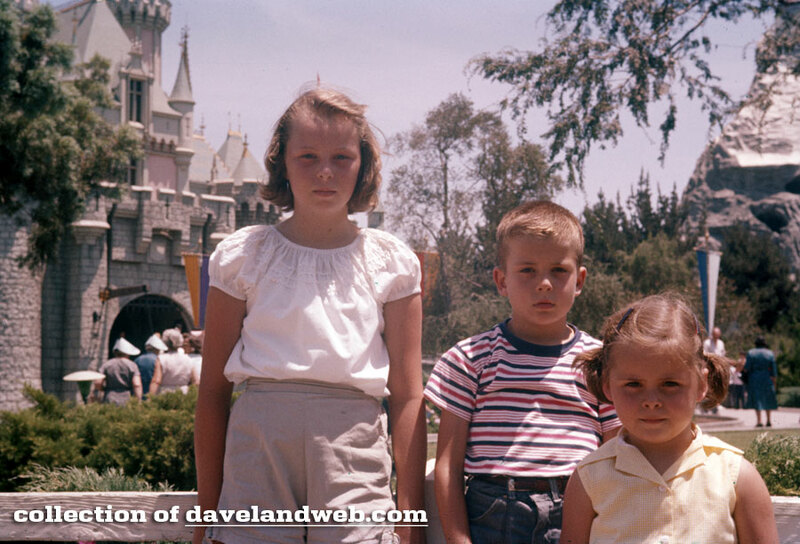 Have you ever seen a more grim bunch at the Happiest Place on Earth?!? Once again, this angle seems suspect, as if it were taken from a higher than possible vantage point. 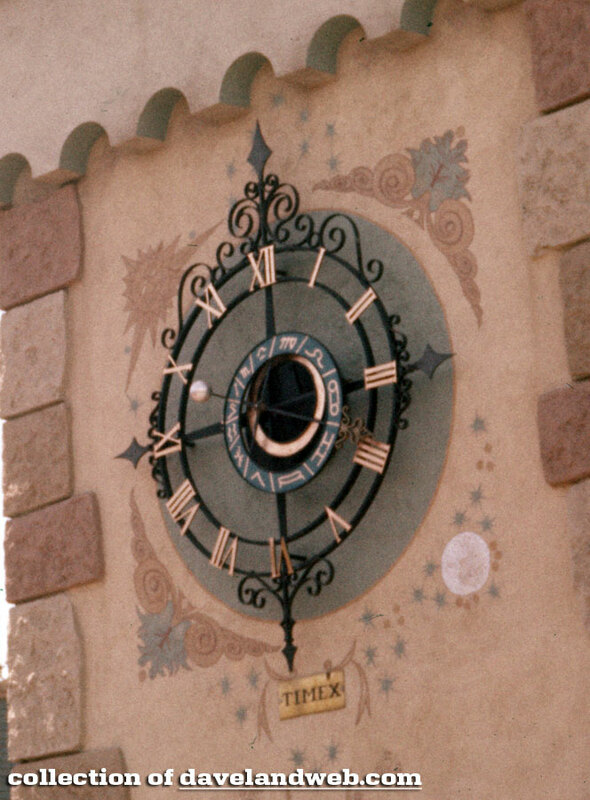 I had to zoom into the clock face; note the plug for Timex. 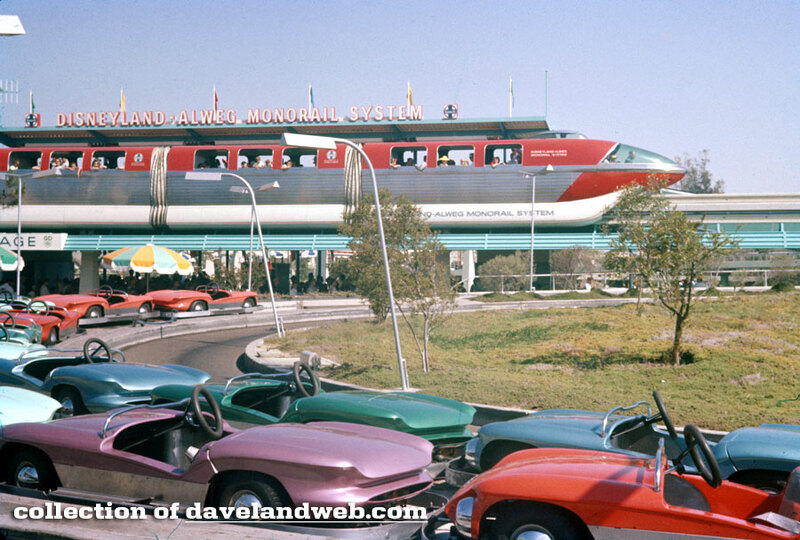 Over in Tomorrowland, this shot layers in the newly christened Red Monorail, the Subs, and a few Autopia vehicles waiting to be revved up. 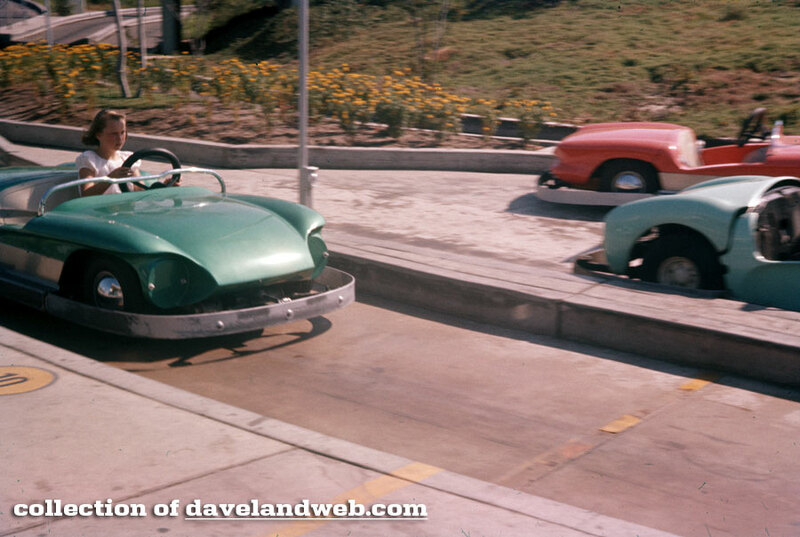 Even on the Autopia, this little girl looks absolutely melancholy. 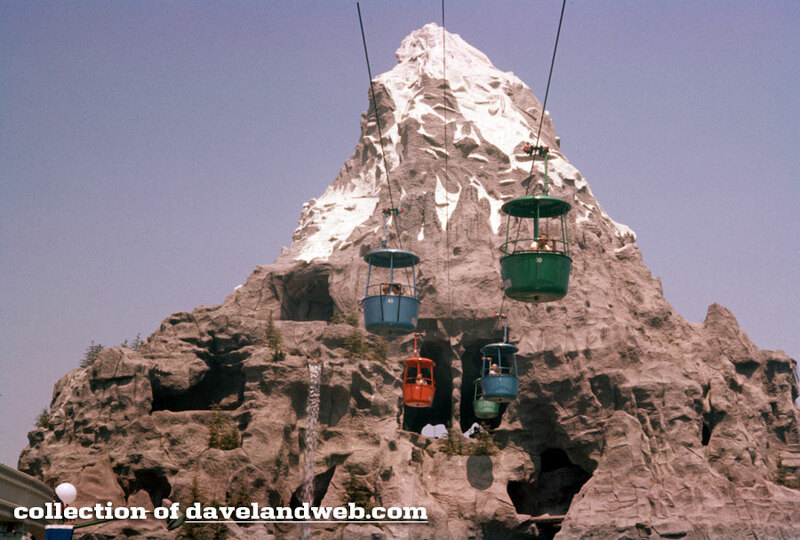 Flying back to Fantasyland from Tomorrowland, after 1959, it was possible to sail through the Matterhorn. 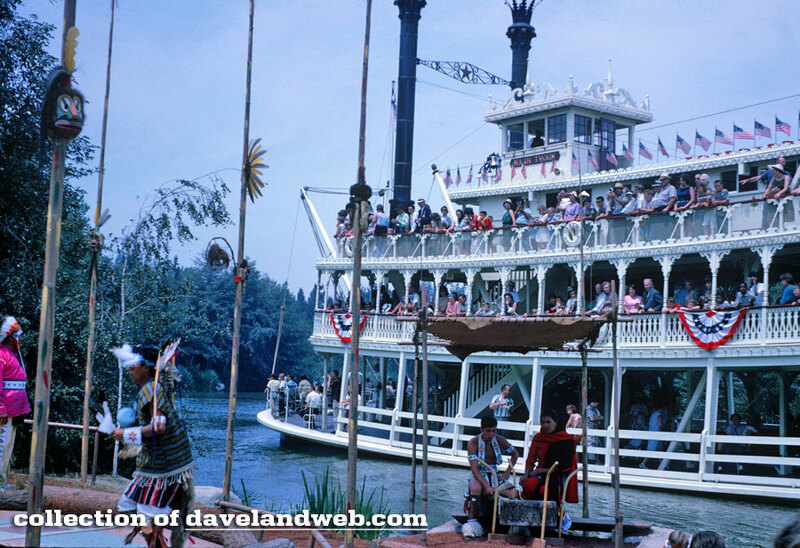 The Twain looks extremely patriotic with its summertime bunting. Drat! I can't zoom into the dead body at the Burning Cabin! 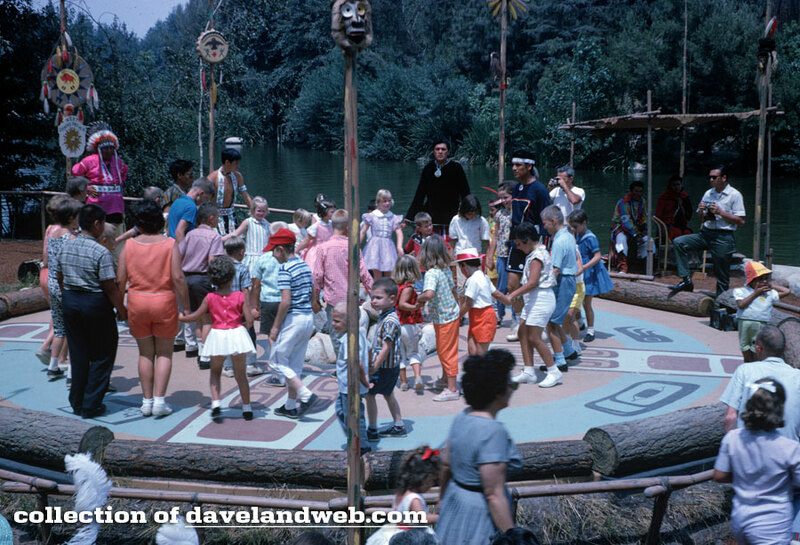 Just around the bend is the Indian Settlement. 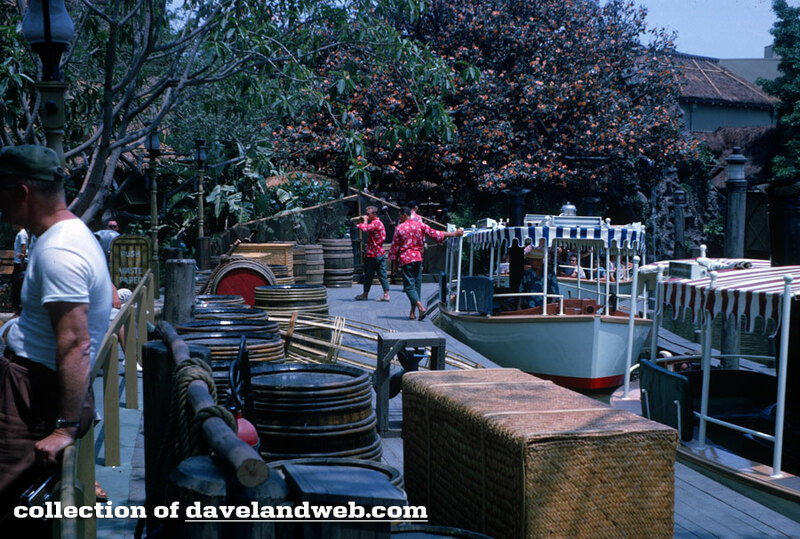 Over at the Jungle Cruise, there are a few random (but somewhat typical) shots. This one did surprise me, though. 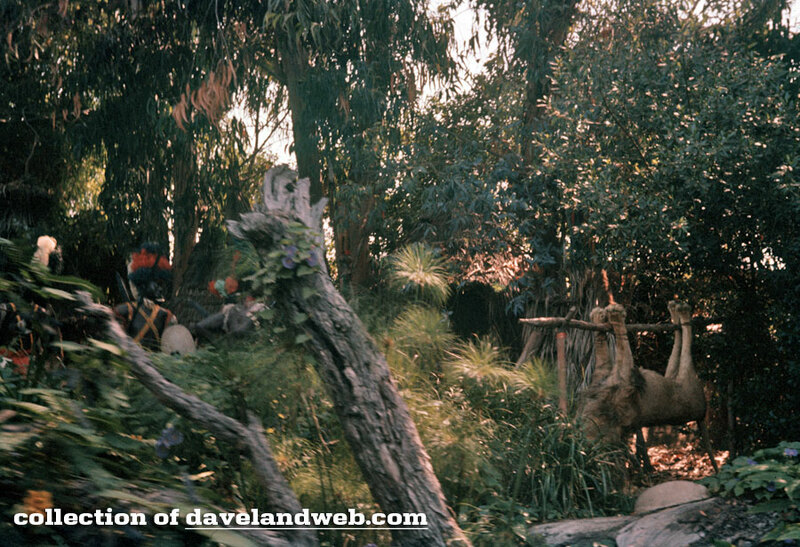 I don't ever recall seeing the lion upside down on the BBQ. 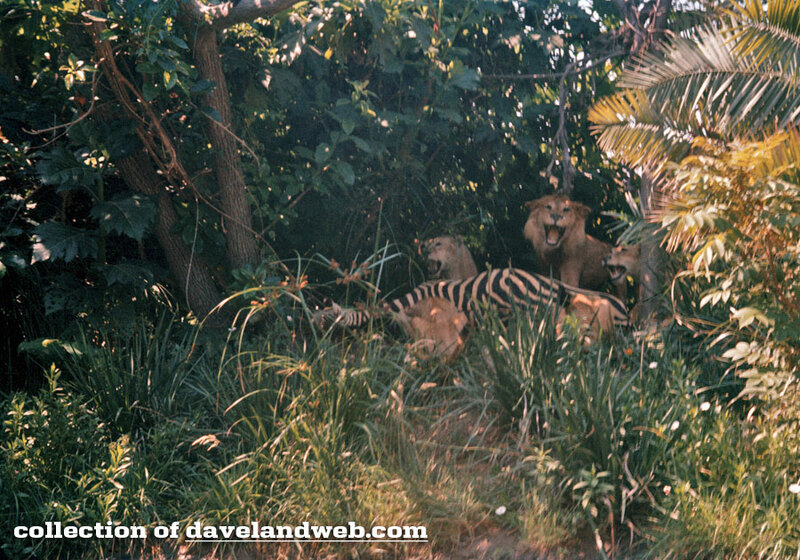 Almost as gruesome as the lions feasting on the dead zebra. I'm all for a little dark humor, but I can't say I miss seeing this particular scene! 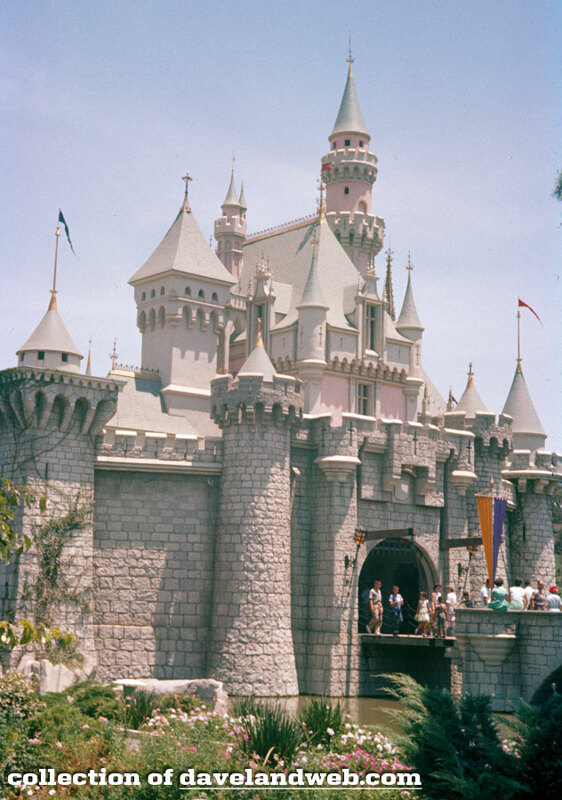 Fifty years ago, this nice little collection of slides was shot at the Happiest Place on Earth. 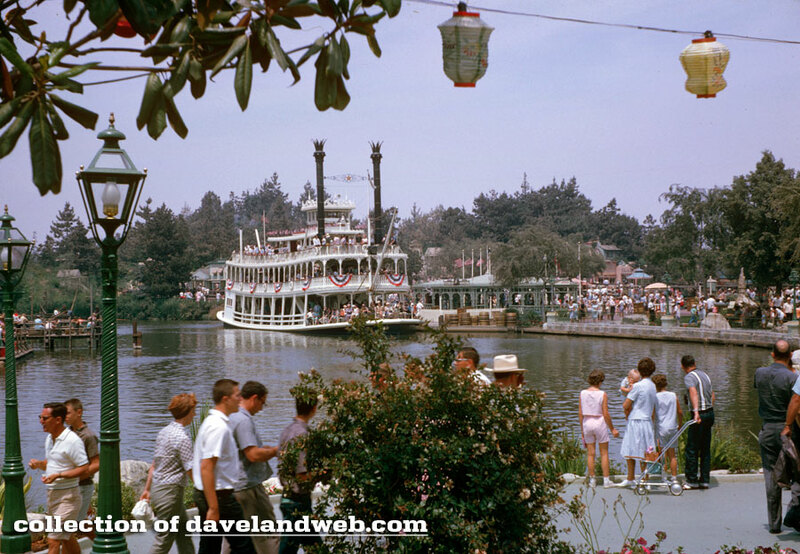 The first image shows the dock of the Jungle Cruise attraction, with one boat of passengers waiting to disembark, and two other boats waiting to be filled. Now THAT'S efficiency! Keep 'em moving, folks! I don't think I'd ever noticed these lanterns overhead. 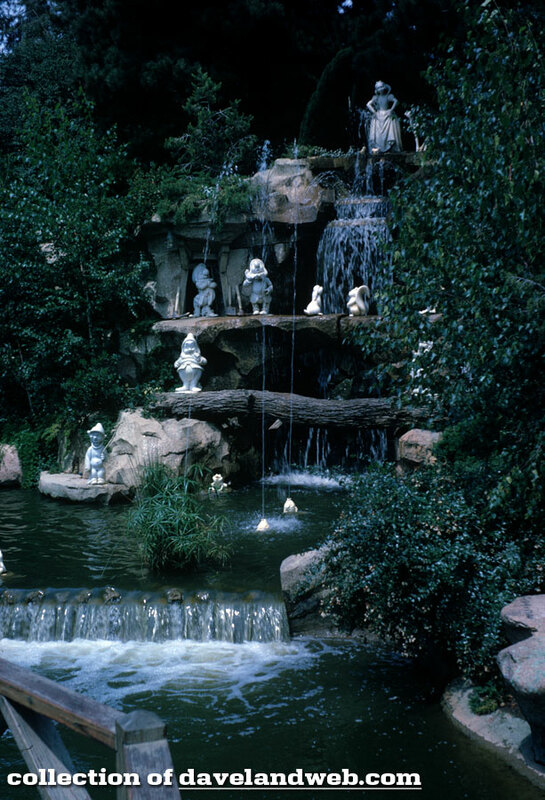 Most likely, they were part of the Chicken Plantation, and also why they can now be seen on the interior of the Blue Bayou Restaurant, whose design was inspired by...The Chicken Plantation. 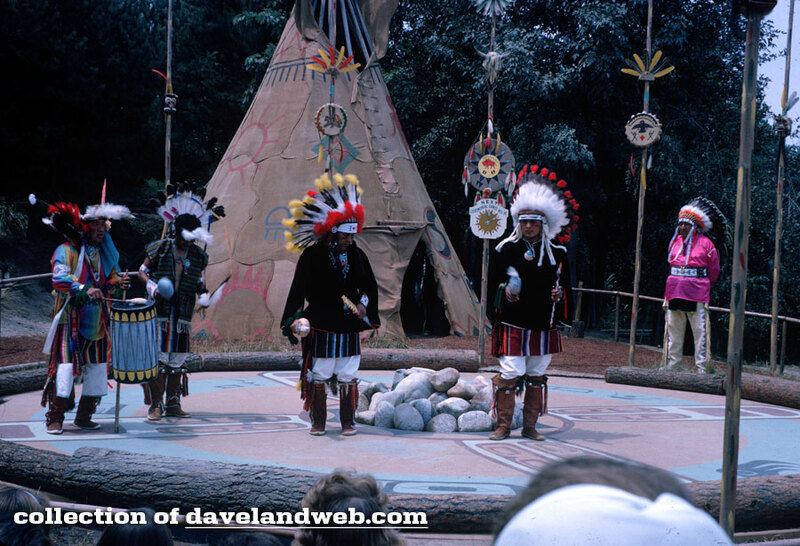 Over at the Indian Village, the next Ceremonial Dance is about to begin. How do I know this? Is it because I have a time machine? No, it's because I can read the signage. 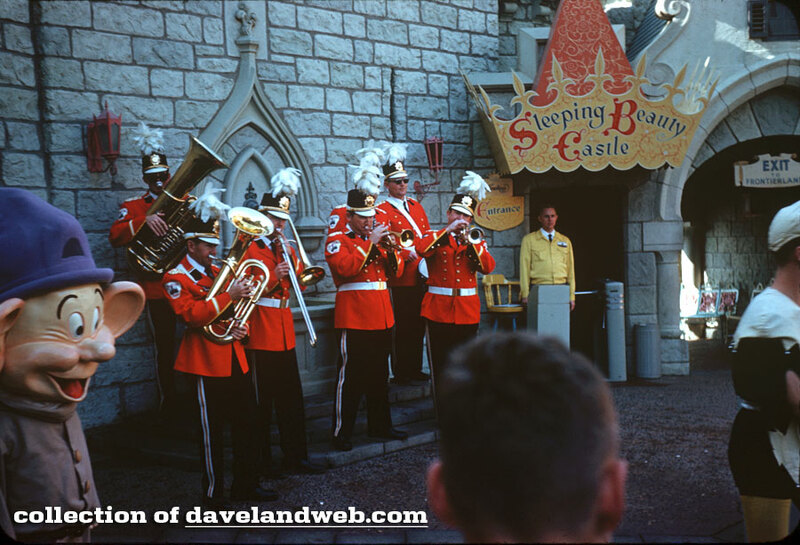 I'm not sure that our photographer was too enthralled by the show. 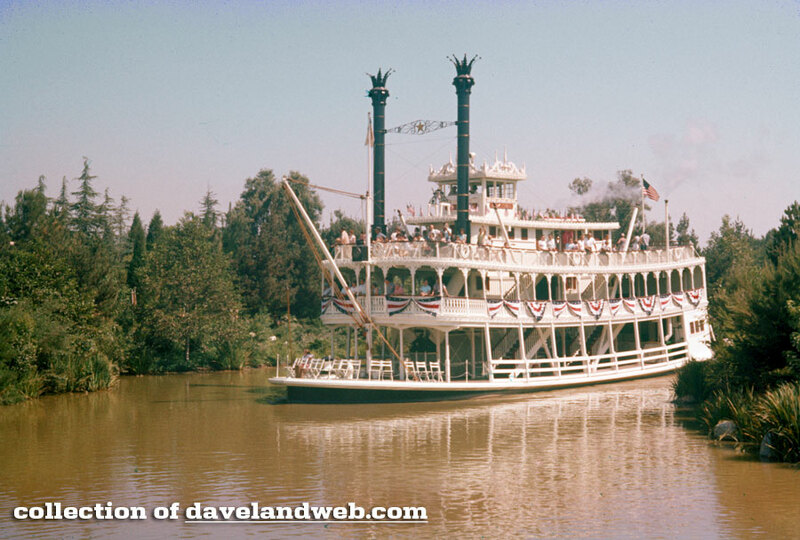 The passing of the Mark Twain was enough to make him look away to capture this shot. I'm glad he did! 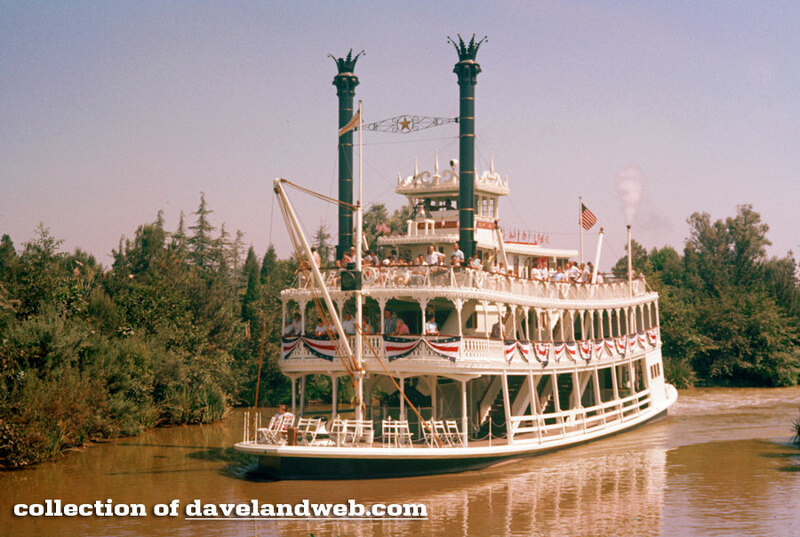 Love the patriotic bunting on the Twain. 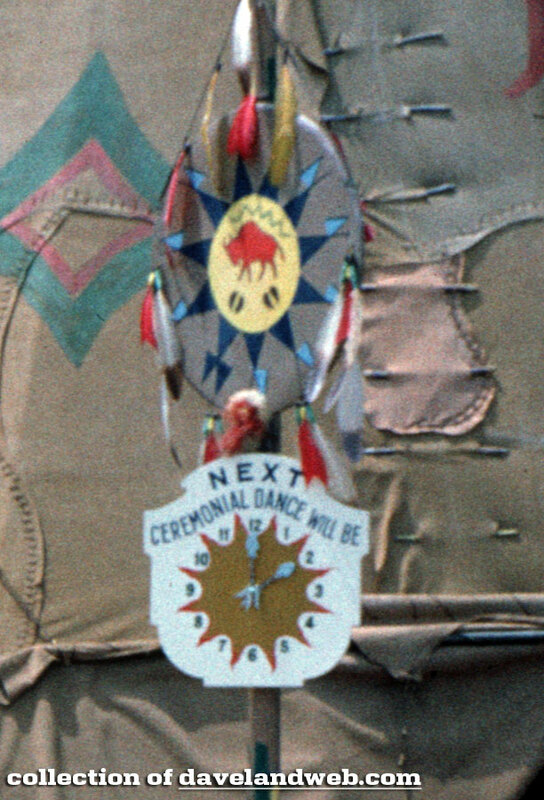 Back to the Dance Circle. Now the little varmints have joined the fun. 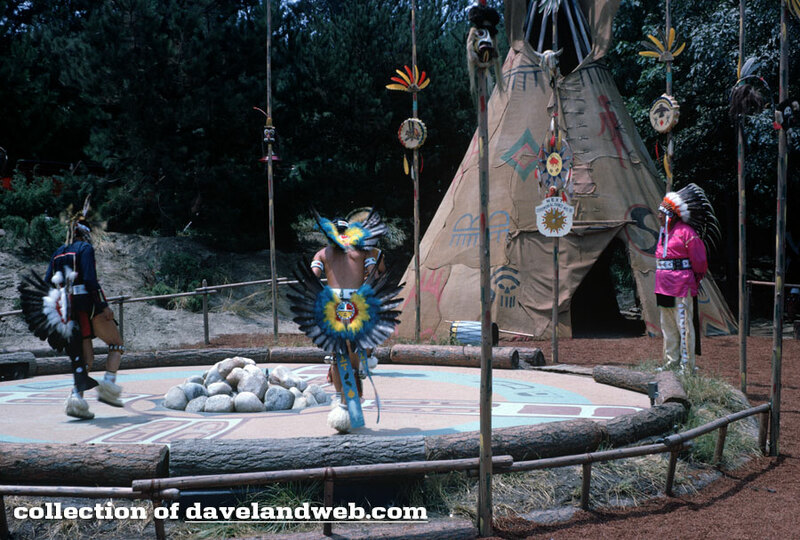 Back out in the uncivilized civilization of Frontierland, you can see Rainbow Ridge and The Nature's Wonderland attraction. If you're over 195 lbs., don't even think about getting on one of these burros (aka small donkey)! 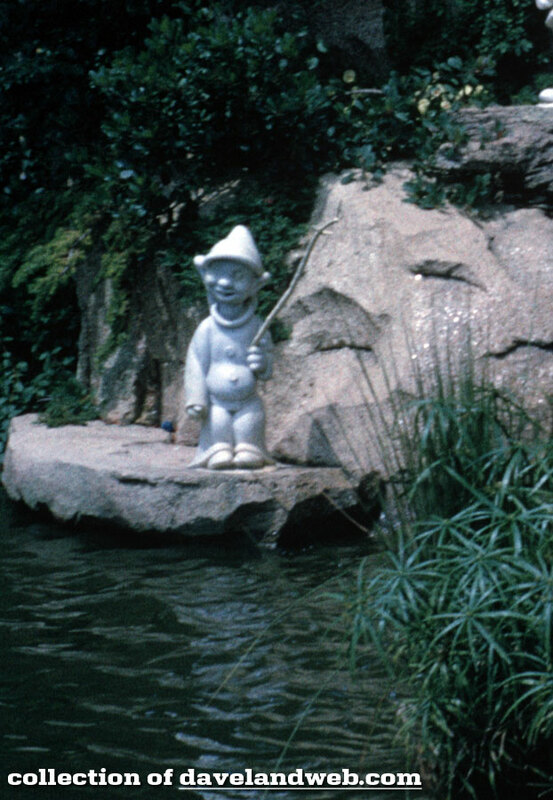 A quick shift over to the outskirts of Fantasyland plops us in front of the Snow White Wishing Well. 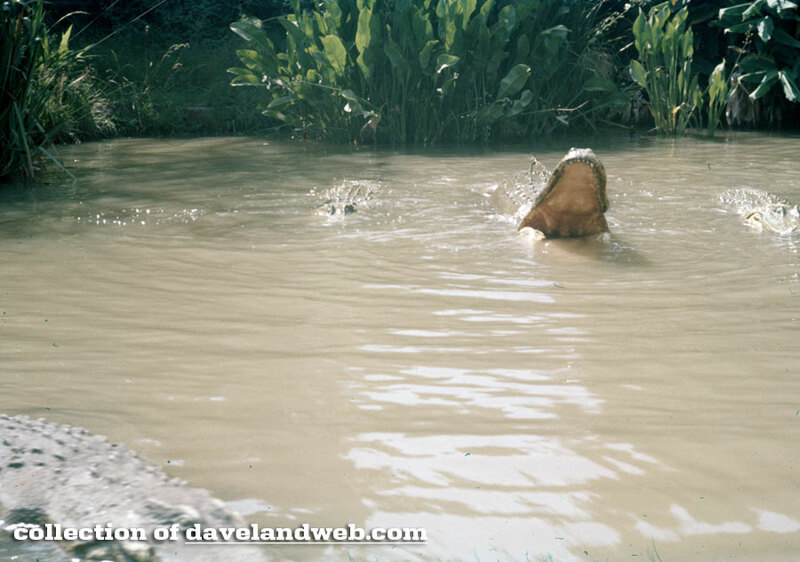 The last one for today shows our photographer having the same anxiety I do whenever I exit the park. Just one more shot! 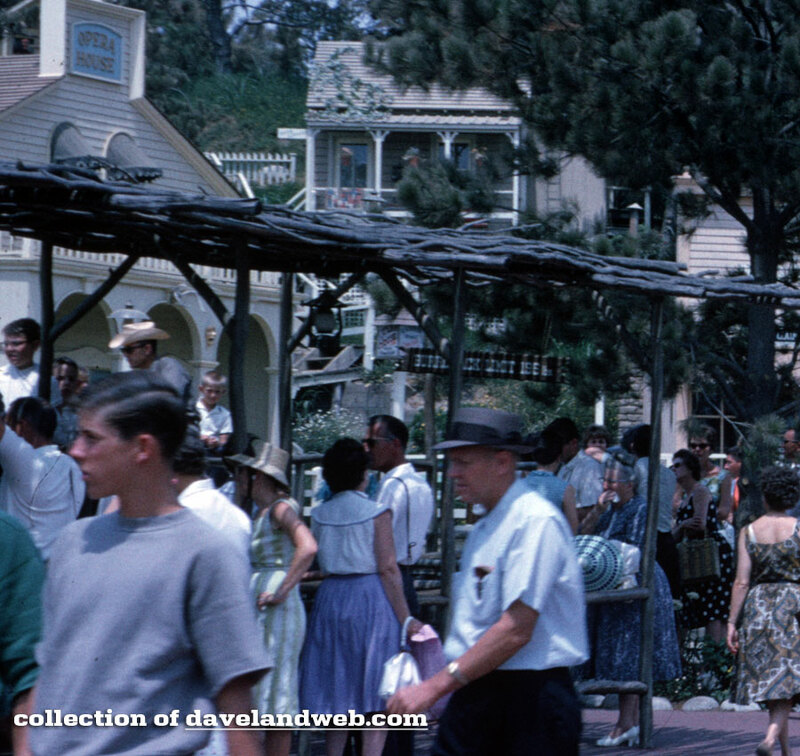 Zooming in you can see the Fred Gurley, waiting to take the cattle cars on the next Grand Circle Tour. 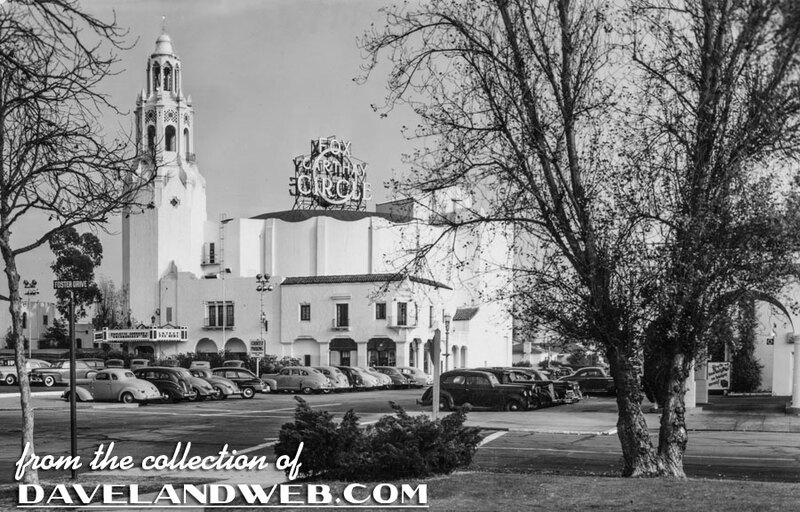 For those of you who appreciate the attention to detail that Imagineers lavished on the recently recreated Carthay Circle Restaurant at DCA, here's a 1947 look at the original inspiration. 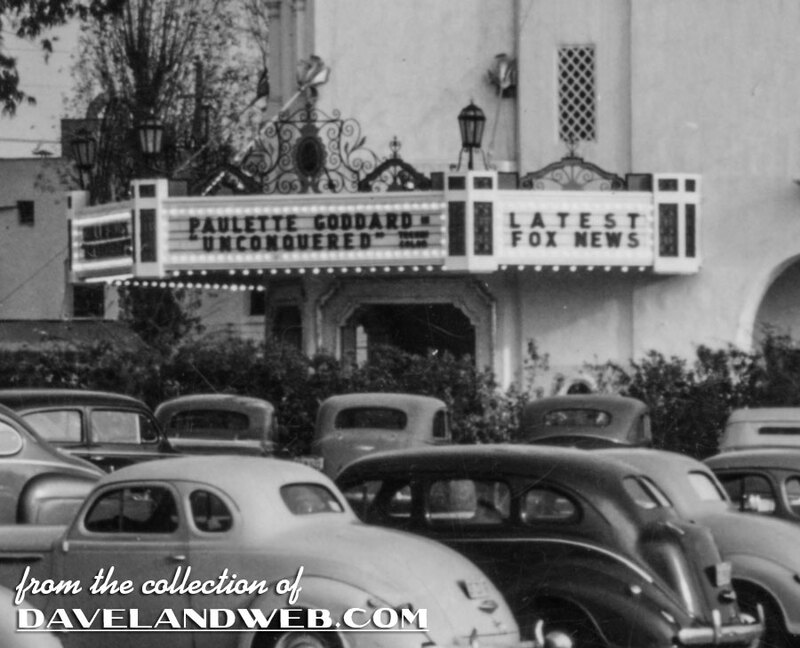 "Unconquered," starring Gary Cooper and Paulette Goddard, was the movie featured on the marquee in this vintage image. 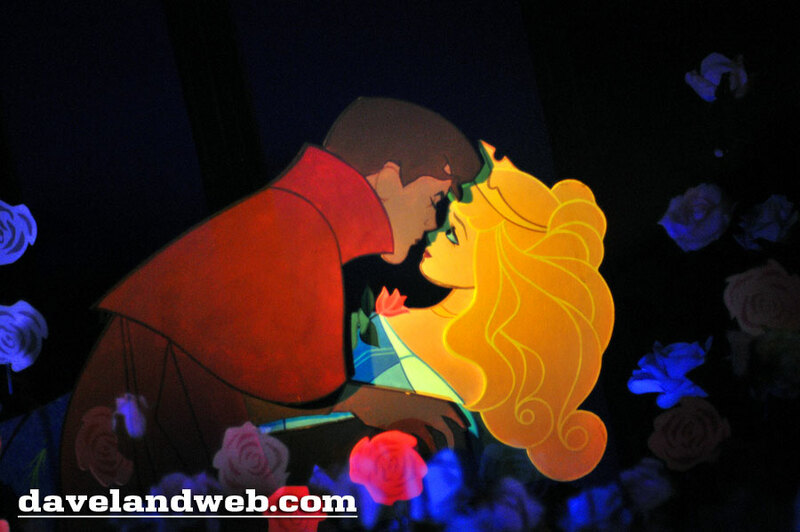 Naturally, Disney left out this detail. 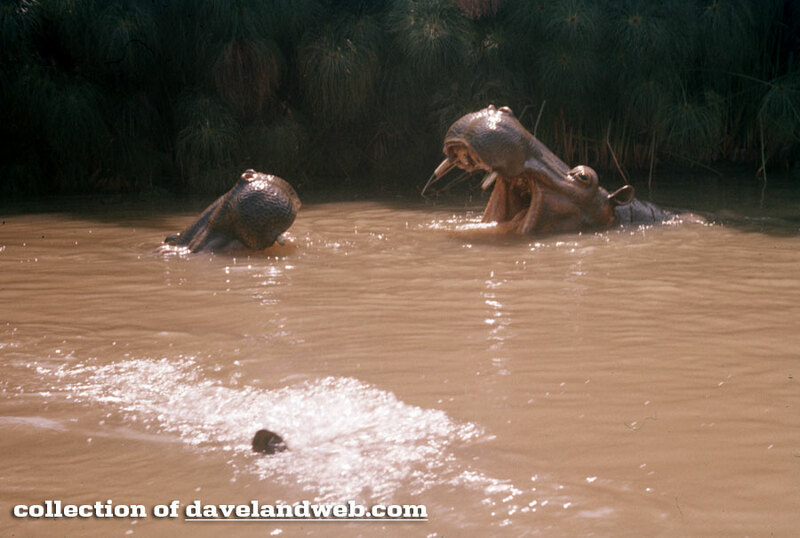 No need to advertise a rival film studio! 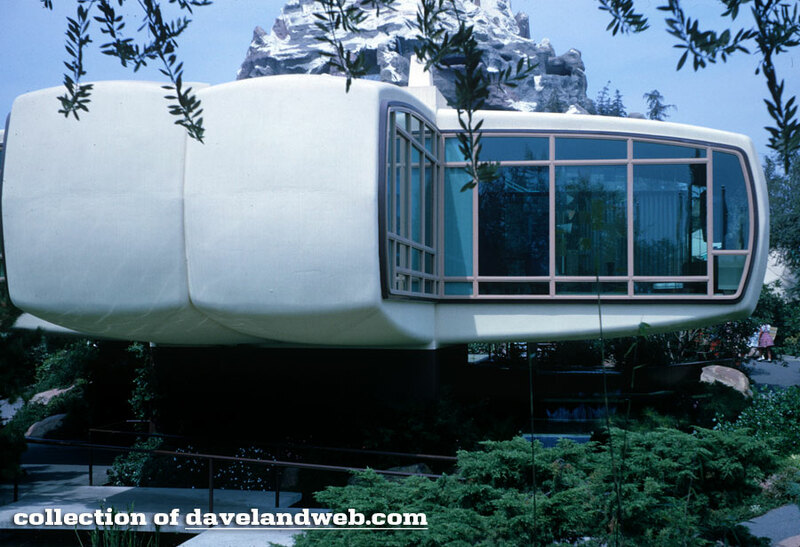 Follow my Daveland updates on Twitter and view my most recent photos on Flickr. 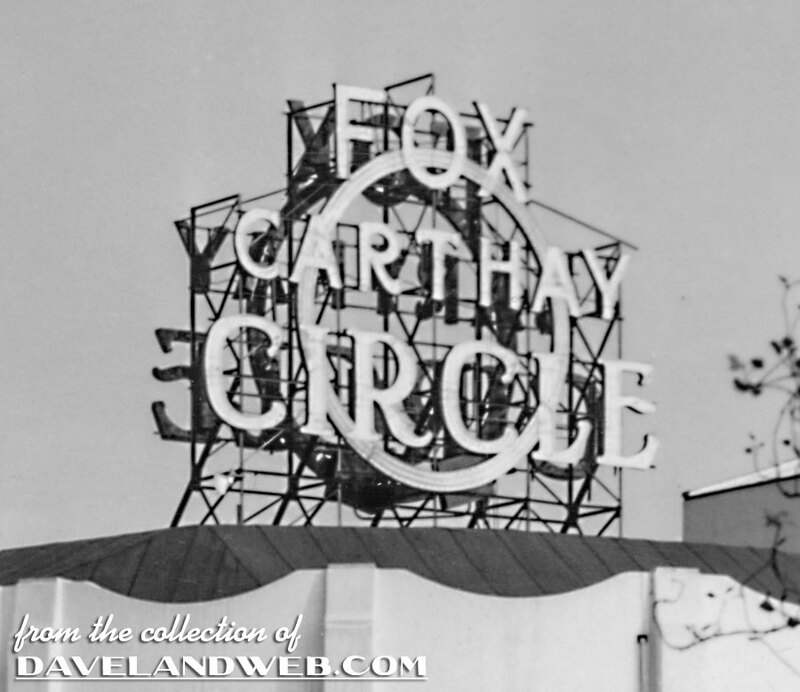 See more vintage and current Fox Carthay Circle Theatre photos on my Carthay Circle web page. 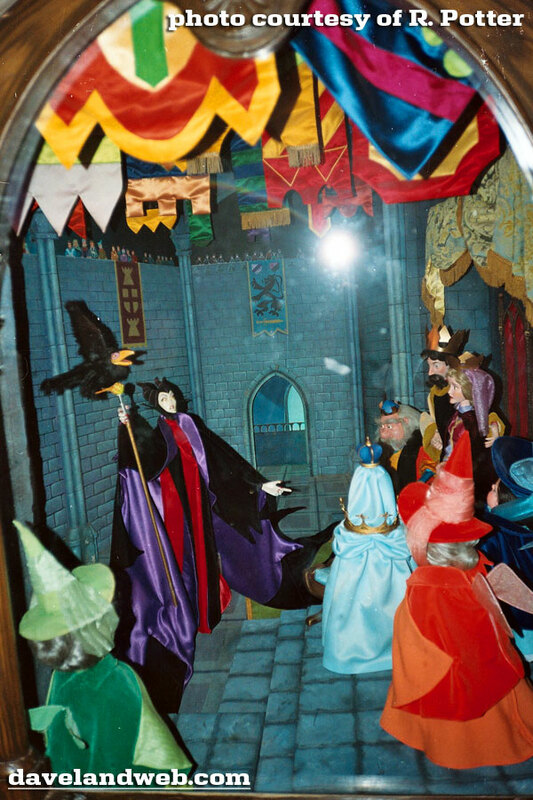 Thanks to Daveland reader R. Potter, I am able to share these amazing shots of the Sleeping Beauty Diorama circa 1991. 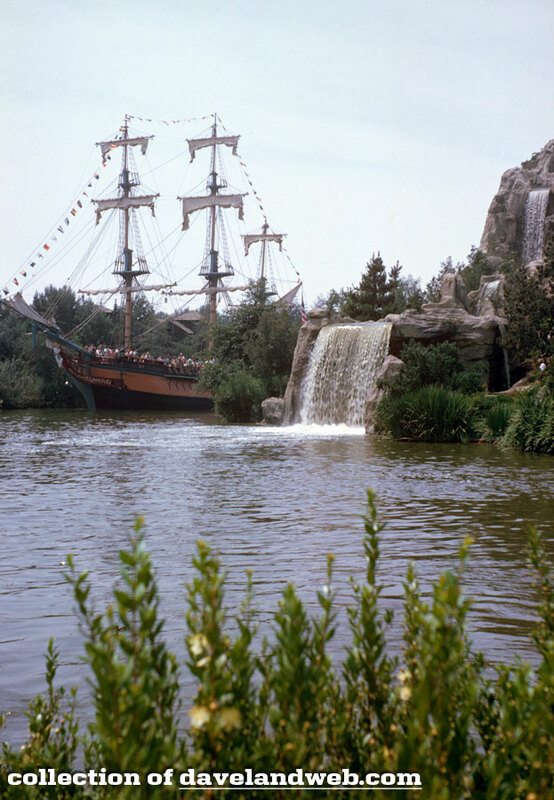 Not the artistic version done by Eyvind Earle, but rather the 1977 "update" that was created to freshen up this attraction. 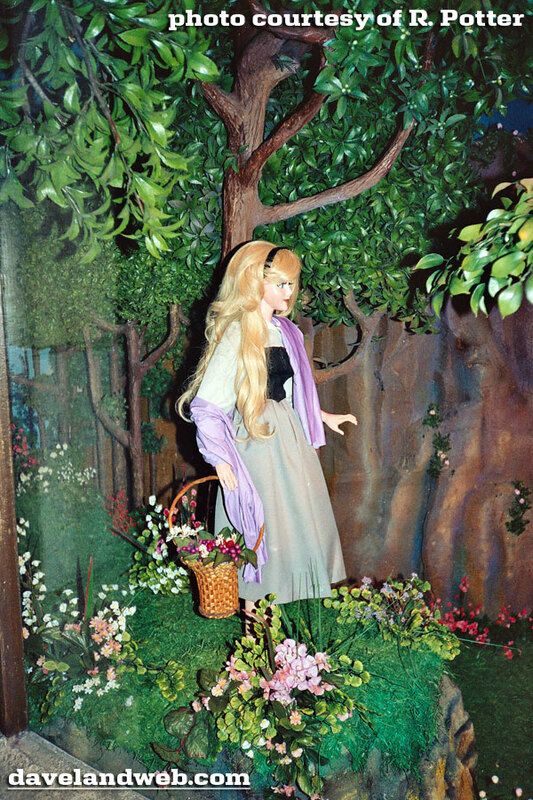 This image of Aurora shows why this version was unofficially dubbed the Barbie & Ken version. 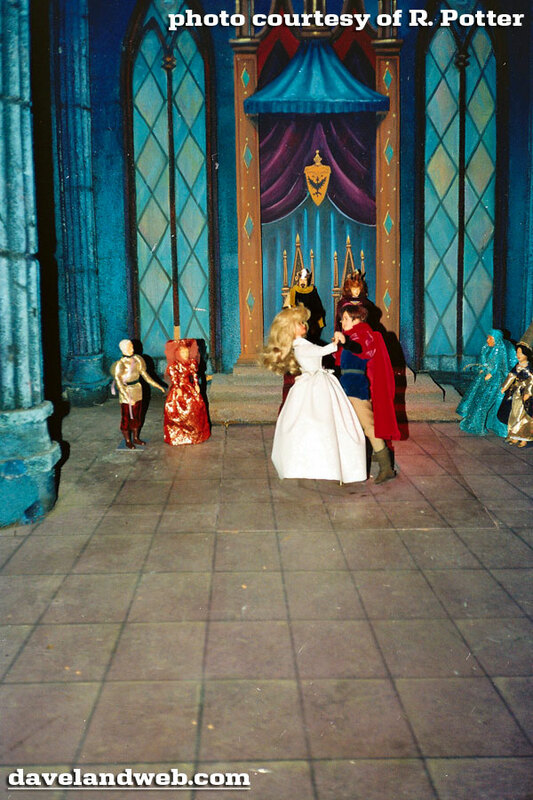 The dolls used have little resemblance to the Disney animated versions. 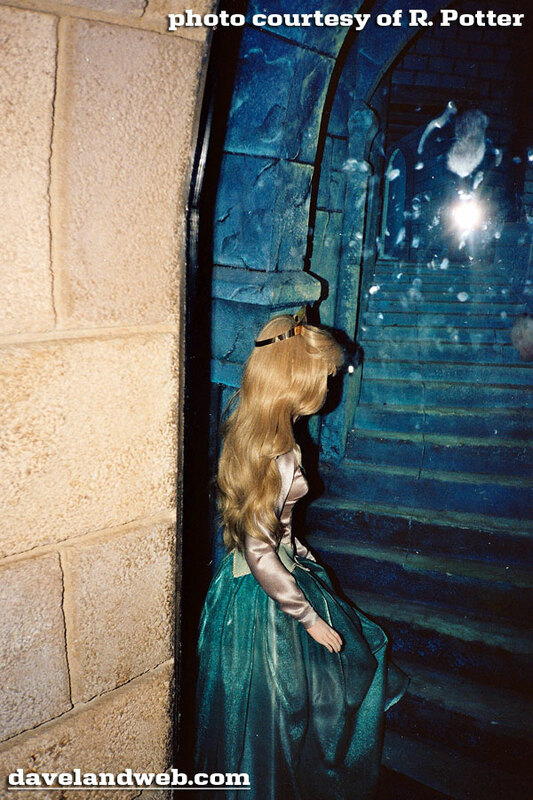 Seeing these photos, I am amazed at how a three dimensional diorama can look so "flat." 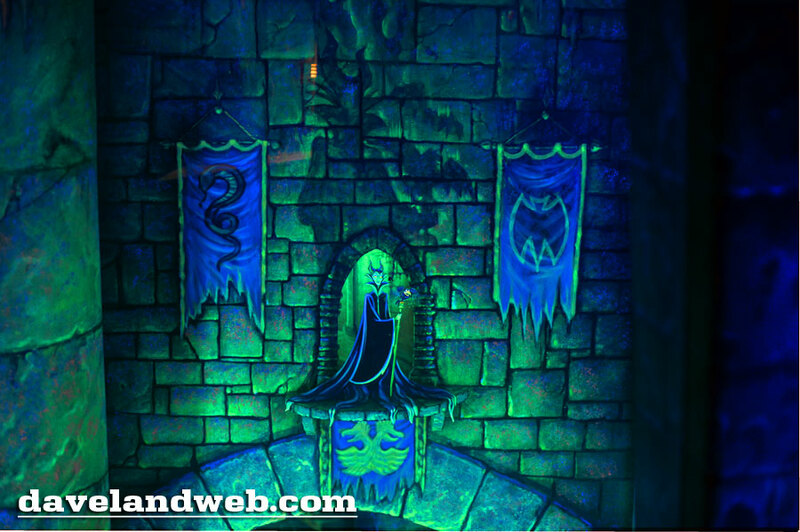 Some of these scenes have no counterpart to the original Earle version or the 2008 reboot. 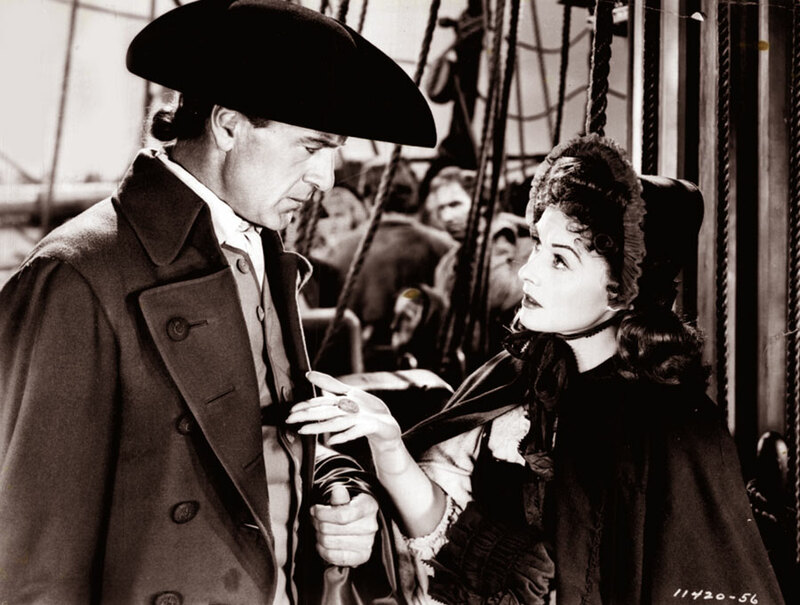 For the three that I was able to match, there is a definite lack of drama and artistry. 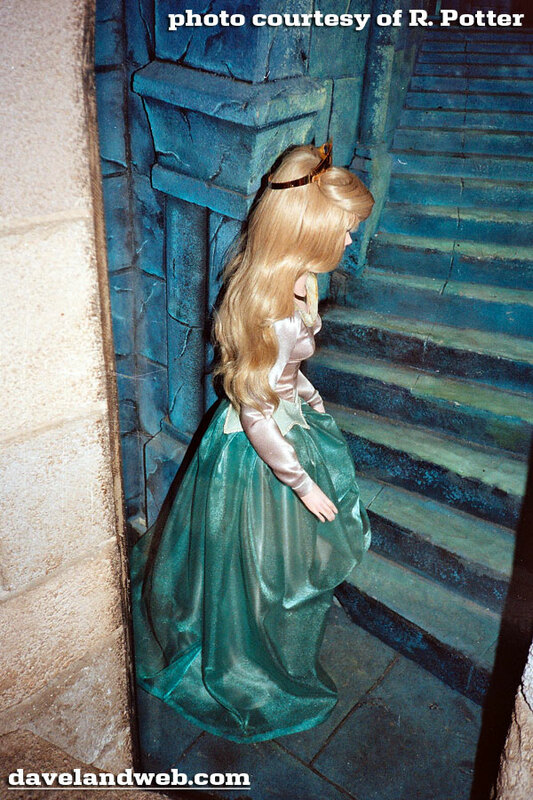 Aurora going up the stairs...so what? 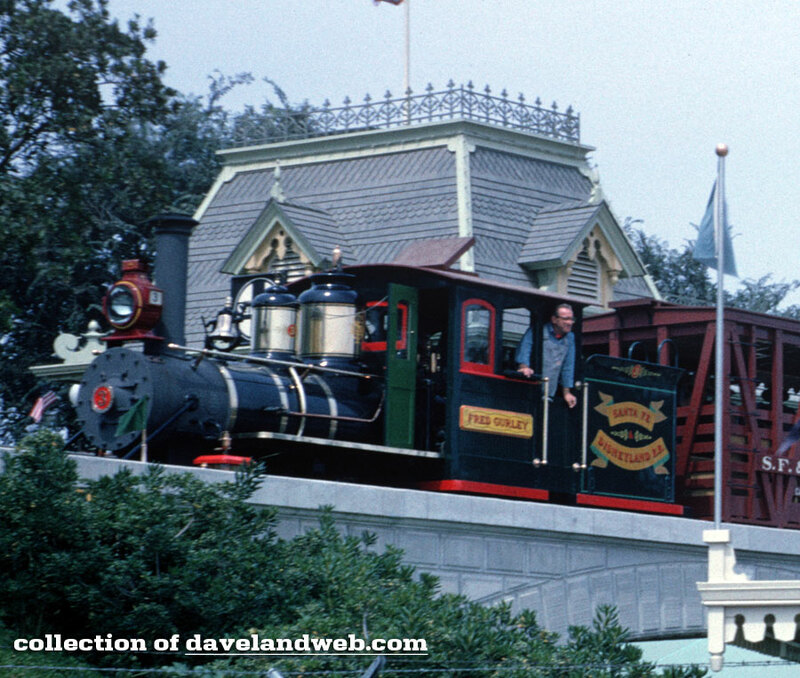 Thanks to R. Potter for the 1991 images used in today's post! 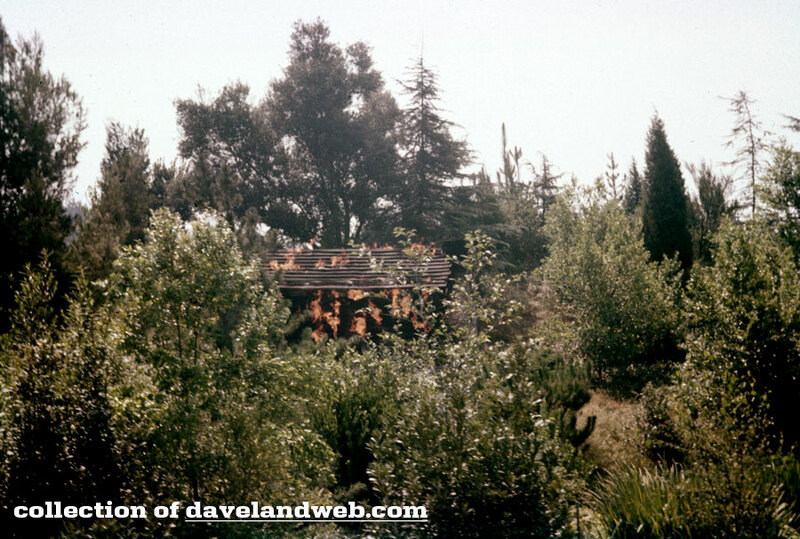 Follow my Daveland updates on Twitter and view my most recent photos on Flickr. 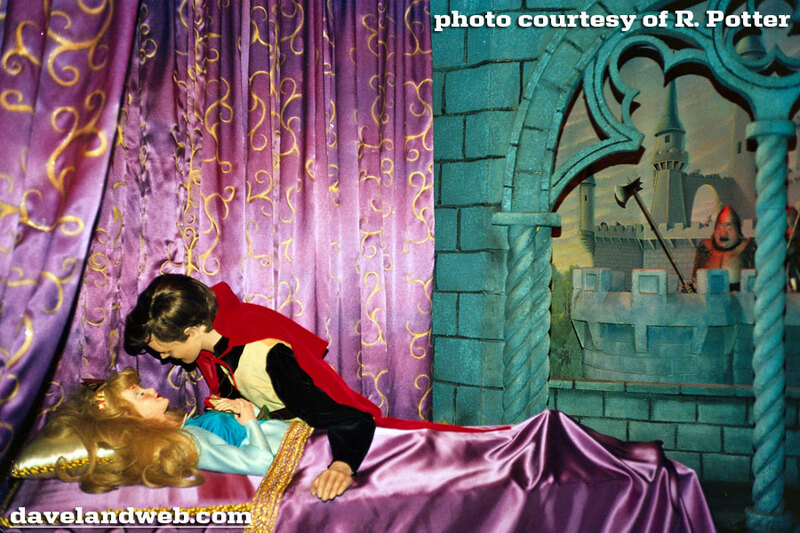 See more vintage and current Disneyland Sleeping Beauty Castle Diorama photos on my SB Diorama web page. Happy 90th Birthday, Judy Garland!